Cherry with rope inlay frame, red suede and gold filet, embossed McGill logo and 24K gold plated medallion. Cherry with rope inlay frame, red suede and gold filet, embossed McGill logo and 24K gold plated medallion. Measures 19 1/2 by 23 1/2 inches and holds 11 by 17-inch horizontal diploma. This product ships directly from our supplier. Expect 2 to 3 weeks for home and in-store delivery. Frame shipping rates for destinations outside of Canada and the U.S. start at $200 per frame. We will send you a shipping quote by email after we receive your order. For a tutorial on how to set up your frame, watch our video here. UNISEX - An instant classic. UNISEX - An instant classic. This unisex pullover hoodie is made from peached fleece, and features a lined hood with drawstring, front pouch pocket, rib cuffs and waistband, and a two-tone embroidered logo up front. Please note that as of March 1st, 2019, the logo on this product has slightly changed. It no longer includes the word "University". Product pictures will be updated soon. Click here to see the size chart for the McGill Classic Hoodie. UNISEX - Rock your school colours proudly in this McGill-emblazoned Russell Athletic crewneck sweatshirt. Made for men and women. UNISEX - Rock your school colours proudly in this McGill-emblazoned Russell Athletic crewneck sweatshirt. Made for men and women. Features rib knit cuffs and waistband, and two-tone twill embroidery. UNISEX- Even when you're on the run - stay in style with our super soft unisex jogger! UNISEX- Even when you're on the run - stay in style with our super soft unisex jogger! Features slim leg with drawstring waist and ribbed cuffed leg hem. McGill University tone on tone embroidery. UNISEX - Even the basics look better with the McGill touch. UNISEX - Even the basics look better with the McGill touch. This unisex crewneck t-shirt is 100% cotton with the University's crest screen printed across the chest. Machine washable for easy wear and care. UNISEX - McGill pride that fits your style! Rock this high-quality New Era 39THIRTY fitted hat for optimum comfort. UNISEX - McGill pride that fits your style! Rock this high-quality New Era 39THIRTY fitted hat for optimum comfort. Features a tone-on-tone embroidered McGill wordmark and a standard bill. Celebrate Canadian men's hockey team's gold-medal win at the Vancouver 2010 Olympics and head coach, McGill alum Mike Babcock, with this 100% silk tie. The 48"-long, 3"-wide tie features the McGill crest and Babcock's insignia. 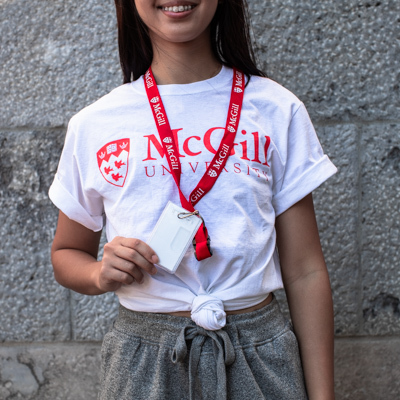 The McGill Re-Usable Water Bottle is our effort to support the Refill McGill initiative and provide a more sustainable solution to our community. As opposed to single-use bottled water, this 20-ounce water bottle is the perfect way to stay hydrated without breaking the bank! Brighten your morning with a McGill red coffee mug made from quality ceramic with a high-gloss glaze finish. Brighten your morning with a McGill red coffee mug made from quality ceramic with a high-gloss glaze finish. White interior and McGill University logo on facing sides. Dishwasher-safe. Hold your documents like a professional. Hold your documents like a professional. 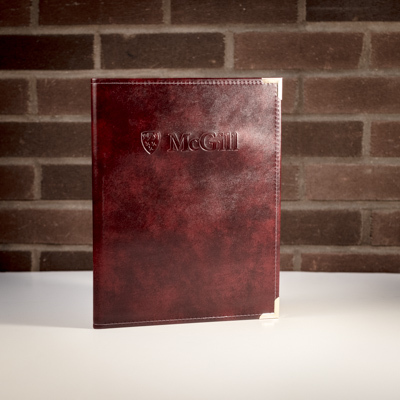 This McGill embossed pad holder is made with brass corners, faux leather, and an opaque-shape pocket with card holder inside the front cover. Comes complete with a pen loop and an 8.5" x 11" lined writing pad. Red lanyard with hard 2-card ID case holds bus pass, student ID, and other standard size cards. Red lanyard with hard 2-card ID case holds bus pass, student ID, and other standard size cards. ¾-inch wide tape in durable polyester nylon weave with snap-fit buckle for quick release. Slit key ring with alligator clip provides place for additional keys, USBs and more. Hangs 27 inches deep. Heat-transfer print of McGill wordmark with crest in white. Our university pennant features large McGill wordmark in flocked white letters on thick, red Veltex. Our university pennant features large McGill wordmark in flocked white letters on thick, red Veltex. This felt-like loop fabric is sturdy yet soft to the touch and perfect for dorm walls, Redman games or campus celebrations. Measures 9 by 27 inches. Flag attention by toting your banner! NEW Deluxe university banner flag is 27 by 54 inches of spectacular and unique design on sturdy 100% nylon fabric. 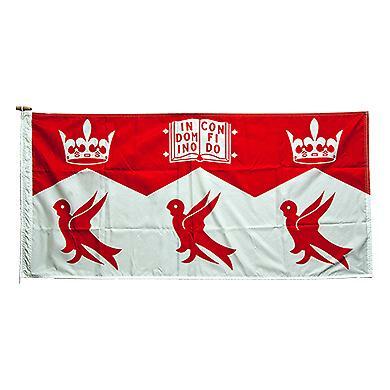 Featuring McGill iconic coat of arms elements and its 3 martlets, the university’s mascot, said to have no feet and so in perpetual flight, always soaring higher in pursuit of higher learning. White double stitched edge. Wooden toggle with nylon cord. So convincing, you won’t believe it’s not leather. So convincing, you won’t believe it’s not leather. Made from a fine blend of synthetic polymers, superior quality vinyl is recognized for its durability and luxurious feel. 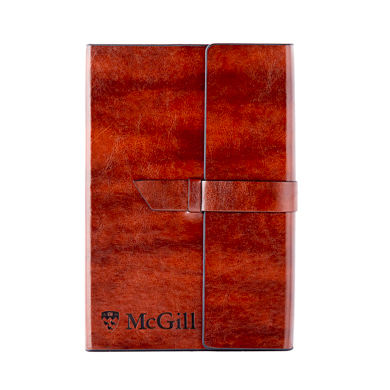 McGill logo laser etched on cover. Sturdy stitch edging. Exterior strap-and-loop closure.160-page notebook with date stamp at the top of each A4 page included. Available in black or brown. Notebook refills also available.